I am slowly but surely starting to break out my Christmas décor, and slowly but surely putting away fall and Thanksgiving items. Normally, I have a very strict routine of not getting any Christmas items out before Thanksgiving. In fact, the only Christmas item I will have out beforehand is our tree (which we will cut down and light – but not decorate – the weekend before Thanksgiving). After Thanksgiving dinner is when I get out all of my Christmas decorations for the tree and home… it makes for a fun holiday activity on Thanksgiving when all the guys are watching football! Since John and I will be out of town in Seattle this Thanksgiving, I don’t feel as much of a need to honor this tradition – I want everything ready for Christmas by the time we get home (and not to mention, Thanksgiving is so late this year that we will hardly have a month to enjoy everything if I don’t get it out beforehand!). Along with festive decorations comes baked goodies and DIYs… I love it all! This past weekend I did my first Christmas DIY for the season. 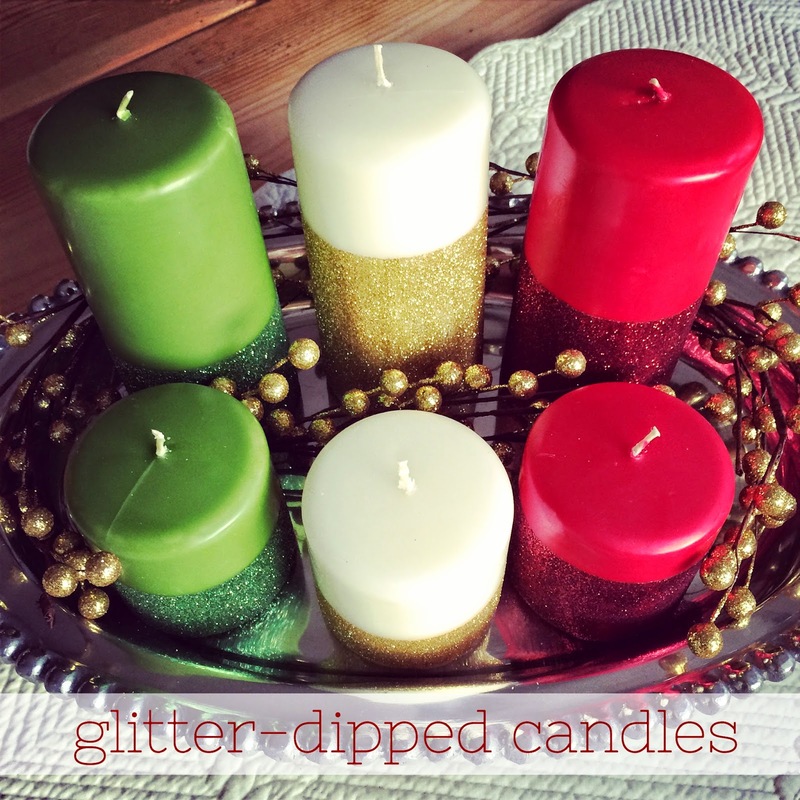 It was easy, inexpensive, and included glitter and festive-scented candles... an all-around DIY win, if you ask me! It is quite simple… start by using the painter’s tape and tape your pillar candles where you want the glitter line to be. I varied the heights of glitter so that they wouldn’t all be uniform (the variations makes them more visually interesting!). 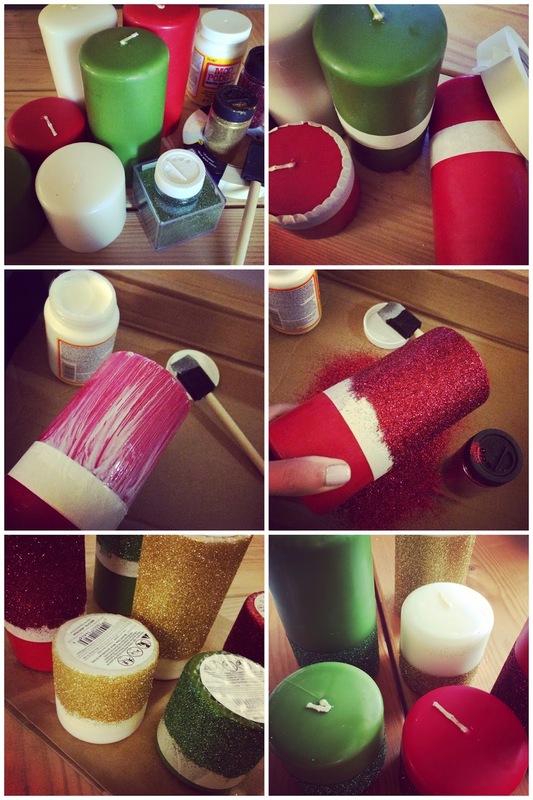 Use a paint brush and cover the lower half of the candle with Mod Podge and sprinkle with glitter. Allow the glitter to dry (I waited over night to be sure). Once the candles are dry, give them a good tap or two to remove the extra glitter and then slowly peel off the tape. Use the tape to clean up any extra glitter, and ta-da! 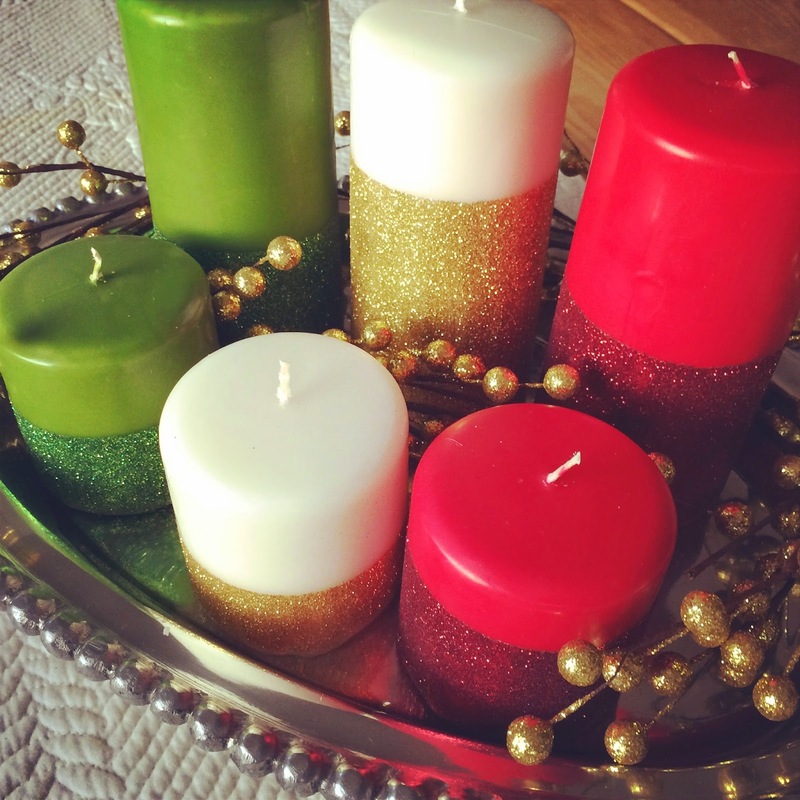 You now have yourself some dressed up holiday candles. Use as a centerpiece or arrange on a mantle or side table. These look great and you make it sound super easy!!! I agree with Thabksgiving feeling super late!!! It feels so short this year!! Your candles turned out great & it's kind of making me want to be crafty this weekend and make some of these myself. Thanks for sharing!! Another DIY win and one that I could actually do!! Such a great idea!! Going home to work on this ASAP. Looks so easy with such pretty results! You have the best simple DIY's ever and I just love it. It's sad that Caleb and I haven't decorated for a season yet. Obviously Christmas is always a must but just being married for a little over a year, we don't have a huge collection of decor for all the other times of the year! I love this! I will be working on a set of my own soon! Cute idea! And seems pretty fool proof! Thanks in advance for a fun project this weekend! Martha Stewart glitter? You are the Martha of the blog world, by the way. These are so, so pretty! They would be a perfect addition to my Christmas decor and to my bar cart year round! Love! I love these! Anything with glitter is an immediate yes from me! These sound easy enough and so pretty! Thanks for sharing! Oooh, these are so pretty!!! What a great idea! Love it. It's just the right amount of sparkle! I love these! I bet a dollar store carries all the supplies too. Great DIY! The white and gold. On point! Thanks for sharing this fun and simple craft! These are so cute! I love how the glitter really adds sparkle to the candles. These are gorgeous and look so simple! My kind of DIY!